I am absolutely loving Zoey Johnson, played by Yara Shahidi, on Freeform’s Grown-ish! 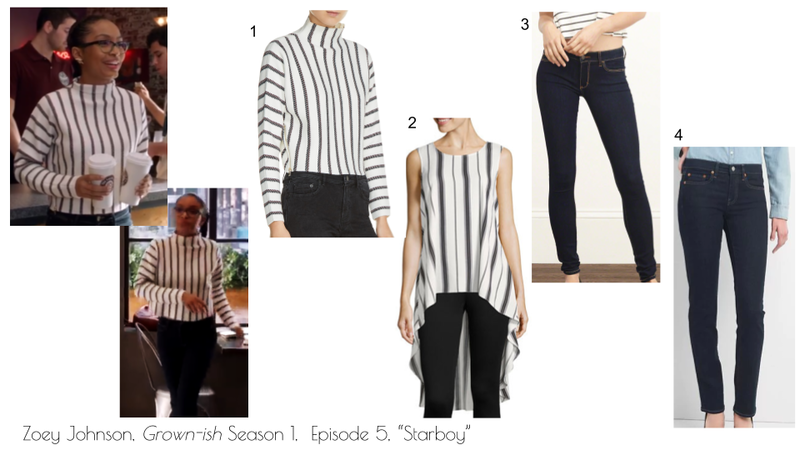 Last week’s episode, “Starboy,” featured a variety of amazing fashion and hairstyles from Zoey. The outfit she wore in the cafe scene was my favorite. Her hair was combed in an intricately designed pony tail, paired with a vertical black and white striped sweater and denim jeans. Totally comfy college style, I’ll say. This is the perfect outfit for mid-winter weather. I live for tossing on a quick sweater with dark pants to head off to work some days. See below for the original sweater (almost sold out on both store links) and a few other items inspired by the look. Be sure to catch Grown-ish tonight on Freeform at 8pm EST!